Given the recent date of this pronouncement, the enemies of the Church occasionally make the claim that Pope Pius was making innovations; that he was adding something to the Faith on his own authority; something that could not be supported either in Scripture or Tradition. But in reality, even though the formal definition of the doctrine of the Assumption came only in the 20th century, the doctrine itself has been almost universally accepted among Christians since the time of the Apostles. In fact even a quick reading of the Apostolic Constitution in which Pope Pius published the proclamation of this dogma demonstrates that it has always been the belief of the Christian people. 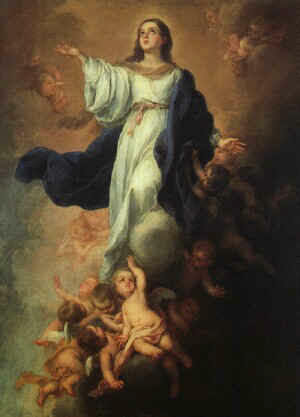 This belief is (at least indirectly) grounded in Sacred Scripture, particularly in the Gospel passage read today, but also in the many passages that can be attributed to the Blessed Virgin in a symbolic way, like the chapter read from the book of Judith as today's epistle; or the woman of the Apocalypse, "clothed with the sun"; or many of the passages from the Canticle of Canticles. The fathers and doctors of the Church are all united in holding that since Mary was preserved by God, and had preserved herself, from every corruption of sin, she merited to be preserved from the corruption of the grave. In reading Pope Pius' citations of these great teachers we hear a virtual litany of the Saints: John Damascene, Anthony of Padua, Albert the Great, Thomas Aquinas, Bonaventure, Bernardine of Siena, Robert Bellarmine, Francis de Sales, Alphonsus de Liguori, Peter Canisius, among many others. From early days the liturgy of the Church has celebrated this dogma, calling it “the Assumption” in the West, or “the Dormition—the falling asleep” in the Eastern churches. If you were to go into an Eastern Orthodox church today, you would find that they are celebrating the same feast as we in spite of the fact that the Eastern and Western churches were in a state of separation for almost 900 years at the time of Pope Pius' declaration. And the Office and Mass books of both East and West contained references to our Lady's Assumption centuries before that. The globe is dotted with churches, basilicas, and shrines dedicated to our Lady under this title, containing innumerable works of art picturing the Assumption, and in which the Faithful meditate on the Assumption while praying Mary's Rosary. But no where in Christendom does any church claim to possess the body of the Blessed Virgin; for just as no church can claim to have the earthly remains of the resurrected Christ, no church can claim to shelter the bones of His Blessed Mother. Even in the middle ages, when the Church might be said to have been “obsessed with relics,” none were claimed to exist. More than one church boasted of having one of her veils or a piece of her clothing, a lock of her hair, perhaps, or a fingernail. But we never hear any claim of true relics of Mary. Mary is “full of grace” and “blessed among women.” She was sinless in her creation as well as in the entirety of her life. She is the one, unique among all mankind, who gave human substance to the body of her Divine Son together with St. Alphonsus we can say that it is inconceivable that this joint flesh of Jesus and Mary could be dishonored with the corruption due to sin and sinners. We can agree with Saint Bonaventure that Jesus would not allow her person to be incomplete, and thus allow her beatitude in heaven to be less than it could be, by making her wait with us sinners for day of general judgment and resurrection. Mary has nothing to be judged. Finally, though, we ought to recognize that even though the Assumption was a singular glorious and exalted privilege of the Blessed Virgin, it holds important instruction and inspiration for us mortal men and women. We too are creatures of body and soul; the one being incomplete without the other. That our Lady has been assumed into heaven with her Son is a pledge of our own future glory, a demonstration, as it were, of our Lord's good faith in promising our resurrection. Pope Pius XII, Munificentissimus Deus (1 November 1950), http://www.vatican.va/holy_father/pius_xii/apost_constitutions/documents/hf_p-xii_apc_19501101_munificentissimus-deus_en.html #44.